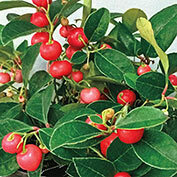 Berry Cascade Wintergreen | Gurney's Seed & Nursery Co.
Berries run the entire length of the stem. Don't want to quote somebody directly but this makes it cascade – that's how it got it's name. 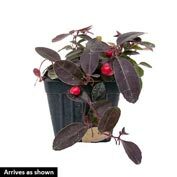 An East-coast native plant, this wintergreen shrub variety grows to only 6" tall with a 12" wide spread, making it ideal as a ground cover. In springtime, Berry Cascade™ produces tons of small white flowers amid glossy, mid-green foliage. From fall to winter, the leaves turn shades of red and deep burgundy and feature brilliant red-orange berries that have a sweet, minty flavor and cover the plant from fall to spring. The foliage and berries look fantastic in seasonal greenery and Holiday floral arrangements. Plant in partially shaded sites for best results. Prefers moist, acidic, well-drained soil. Exhibits good disease and pest resistance, and is easy to grow and maintain. Hardy in Zones 3-9. Light Required: Partial or full shade. Plant in partially shaded sites for best results. Foliage: Glossy, mid-green foliage. From fall to winter, the leaves turn shades of red and deep burgundy. Red-orange berries have a sweet, minty flavor and cover the plant from fall to spring. Fruit: Brilliant red-orange berries run the entire length of the stem. Flower Form: Produces tons of small white flowers. 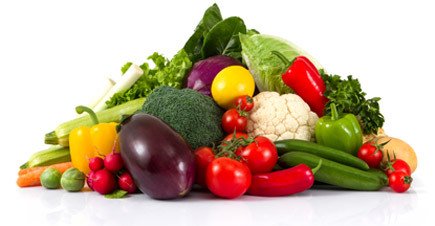 Soil Requirements: Prefers moist, acidic, well-drained soil. 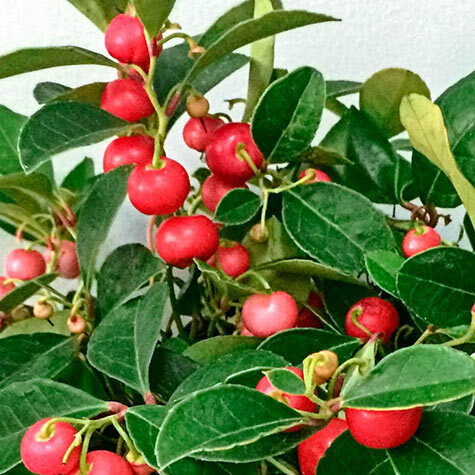 Comments: Wintergreen is one of those plants everyone should have in their landscapes. It's a compact groundcover that offers several points of interest. From its attractive green foliage, to its pleasing white blooms and bright red berries, there's no end to the benefits of growing this petite shrub. Its fruits are beautiful set against the backdrop of its evergreen foliage, and they taste as good as they look!